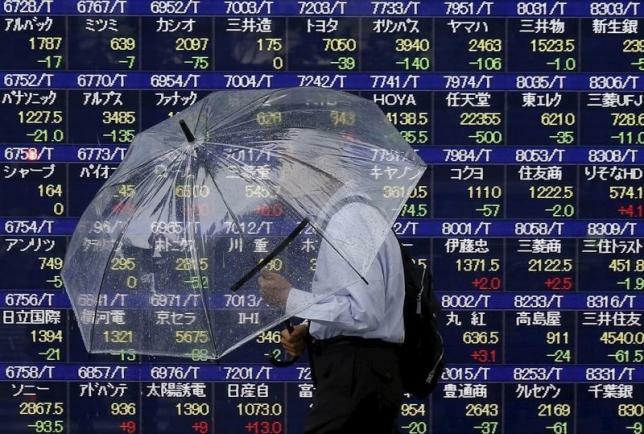 TOKYO – Asian stocks hit a seven-week high on Wednesday as a pick up in oil prices boosted resource shares and emerging economy currencies, with sentiment also helped by South Korea’s Samsung Electronics issuing better than expected profit guidance. MSCI’s broadest index of Asia-Pacific shares outside Japan gained 1.6 percent, to reach its highest level since Aug. 20. Samsung Electronics’ 005930.SS led the gains, surging 8.7 percent. The smartphone giant said it would post its first quarterly profit gain in two years due to strong sales of chips and displays, though analysts attributed much of the earnings surprise to the weaker won. “Exporters are rising as Samsung Elec’s earnings guidance signalled that exporters could show better-than-expected earnings thanks to a weak won,” said Rhoo Yong-seok, an analyst at Hyundai Securities. European shares are expected to be steady to slightly softer, with spread betters looking for a flat opening in Britain’s FTSE .FTSE and Germany’s DAX .GDAXI and a fall of up to 0.2 percent in France’s CAC 40 .FCHI. Japan’s Nikkei .N225 rose 0.8 percent, recovering from brief losses after the BOJ refrained from easing, as speculators reckon Governor Haruhiko Kuroda could opt to unleash new stimulus as early as its next policy meeting on Oct. 30. “A lot of people think that the BOJ will act at the end of October due to the weak conditions in the Japanese economy,” said Seiki Orimi, senior investment analyst at Mitsubishi UFJ Morgan Stanley Securities. A jump in oil prices helped offset some concerns that China’s slowdown could lead to overcapacity in many industries, especially the resource sector. Crude futures prices broke out of month-old trading ranges, in part supported by news that non-OPEC producer Russia and key OPEC member Saudi Arabia discussed the oil market last week. Oil traders were encouraged by expectations that the world’s two largest oil exporting countries may take measures to ease the supply glut, even though analysts have warned that their opposing positions over Syria could hamper cooperation. Brent, the global benchmark for crude, hit a one-month high of $52.53 per barrel, adding 1.1 percent in Asia on top of a 5.4 percent rise the previous day. A rise above its Aug. 31 high of $54.32 could fan optimism that the worst may be over for the oil market. U.S. crude futures managed to climb above its late August peak to hit their highest level since late July, rising to as high as $49.44. Silver XAG= also jumped to 3 1/2-month high of $16.095 per ounce on Tuesday and last stood at $15.935. Risk assets were also underpinned as many investors have scaled back their expectations that the Federal Reserve would raise interest rates this year following surprisingly weak U.S. jobs data on Friday. The Indonesian and Malaysian currencies, the worst performers among emerging Asian currencies this year, both reacted positively. The Indonesian rupiah IDR=ID surged 2.3 percent on Wednesday, taking its gains so far this week to over five percent. The Malaysian ringgit MYR= also jumped 2.4 percent. The New Zealand dollar NZD=D4 popped to a seven-week high on a solid rise in dairy prices. The Australian dollar hit a two-week high AUD= of $0.7188 while the Canadian dollar firmed to C$1.3026, nearing its September peak of C$1.3013. The euro traded at $1.1267 EUR=, near this week’s high of $1.12895. The dollar’s index against six major currencies fell to 95.327, its lowest level this week and near Friday’s low of 95.218.